So this post is a little late to the game but better late than never. 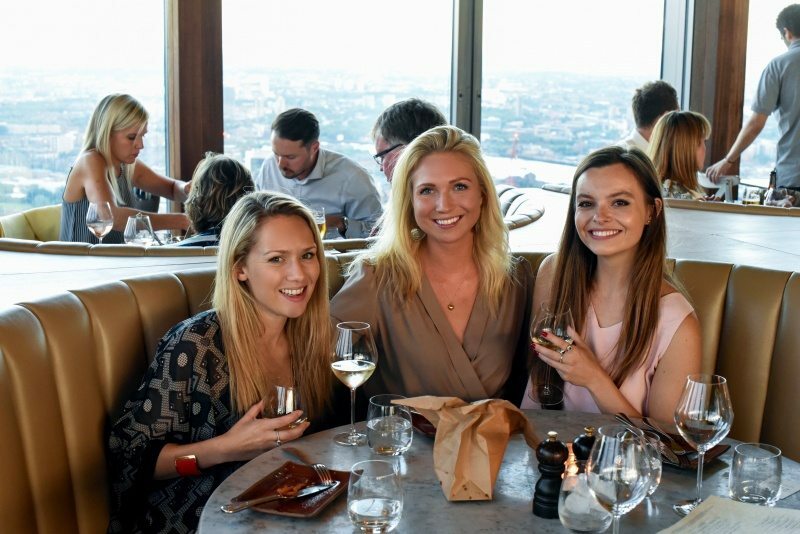 If you care to remember it was my birthday in June and I celebrated the day dining high in the sky at Duck & Waffle together with a handful of my favourite girls. 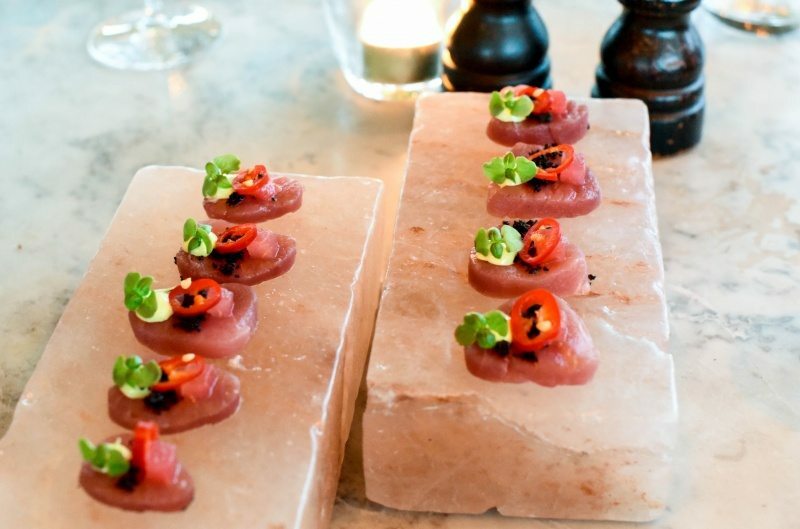 Following on from cocktails by the infamous orange tree of Sushisamba, we moved to the beautiful restaurant located on the 40th floor of the Heron Tower for an evening of pure indulgence and good company. 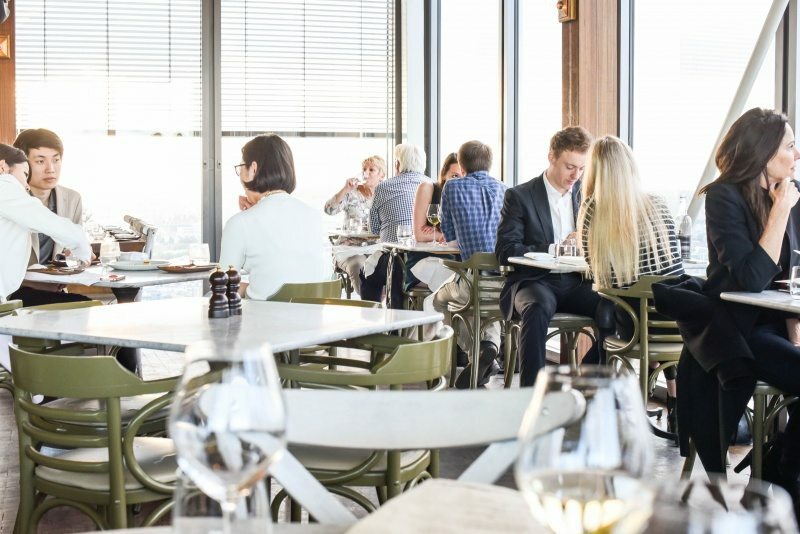 I’ve visited Duck & Waffle a number of times and am a big fan, so was excited to get stuck in and finally be able to blog it for the first time. Bacon wrapped dates, linguiça sausage and mustard (£3.50 each) are hands down the best thing on the menu, and one of the best things that you’ll ever eat in your life. I could very easily & happily have eaten just a plate of these and been utterly satisfied with my meal. 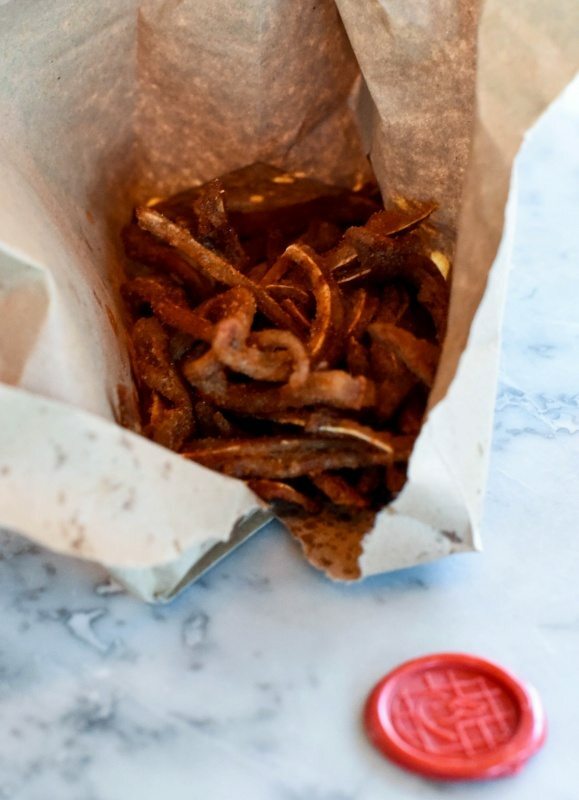 The balance of sweet, salty and savoury, gooey and crispy, is so perfect it will make you want to cry with happiness. I have no shame in saying that we spent almost £40 on dates alone. 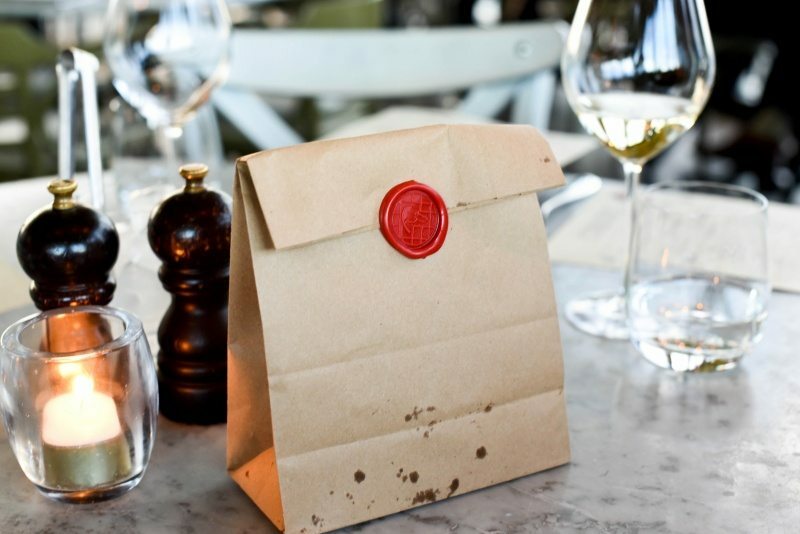 Our other “snack” was the BBQ-spiced crispy pig ears (£5.00), iconically served in a brown paper bag held shut by a red seal embossed with the Duck & Waffle logo. Personally, I’d give these a miss, though both Grace & Josie really liked them with Grace ordering an extra bag to take home to her boyfriend, so maybe they have a Marmite effect. I, however, think they just taste of smoky crisp burnt grease with no discernible pork or even meat flavour. Thoughts if you’ve had these before? 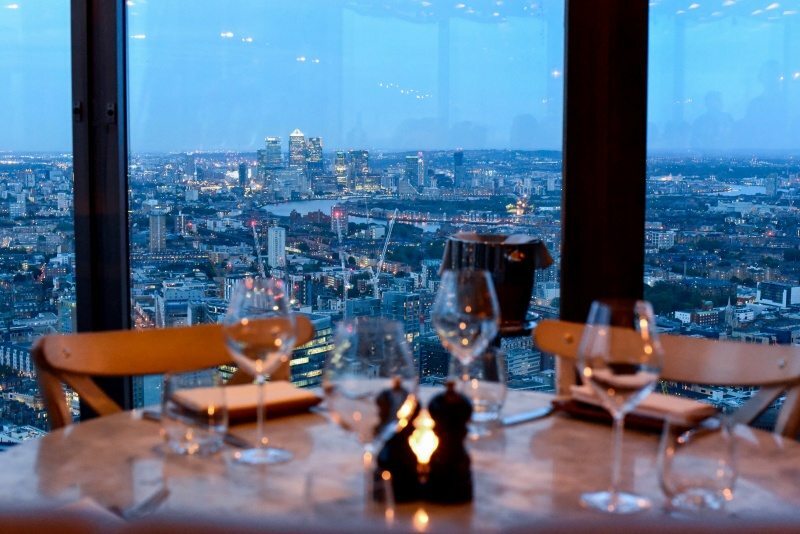 We couldn’t have asked for a better evening with the clear blue skies illuminating London in her most elegant light, and providing the most beautiful backdrop to our meal. 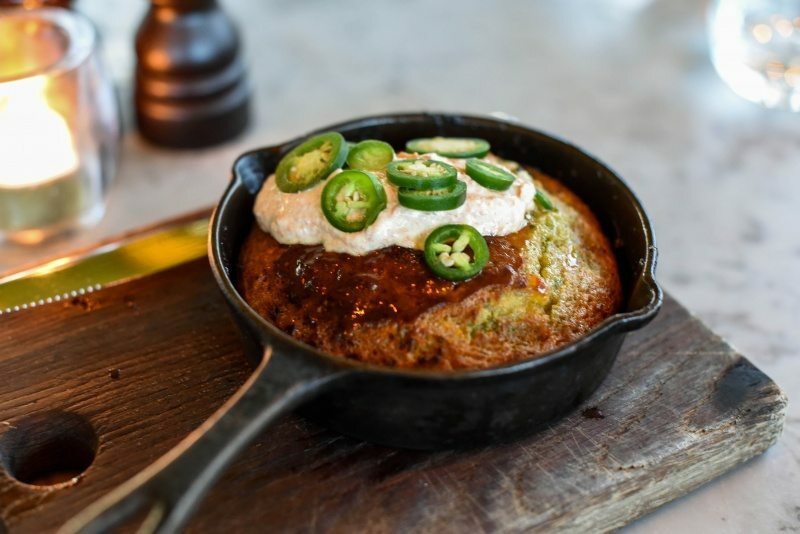 The maple glazed cornbread with harissa yoghurt (£7.00) was OK. The bread was fluffy & moist but relatively flavourless, which is a shame as I think had more chillies and yoghurt been added, it could have been a real winner. On to the *equal* first place favourite of the night; Angus beef tartare with pickled onion, mustard, marmite egg yolk and dripping croutes (£11.00). For me, the best beef tartare I’ve ever eaten. 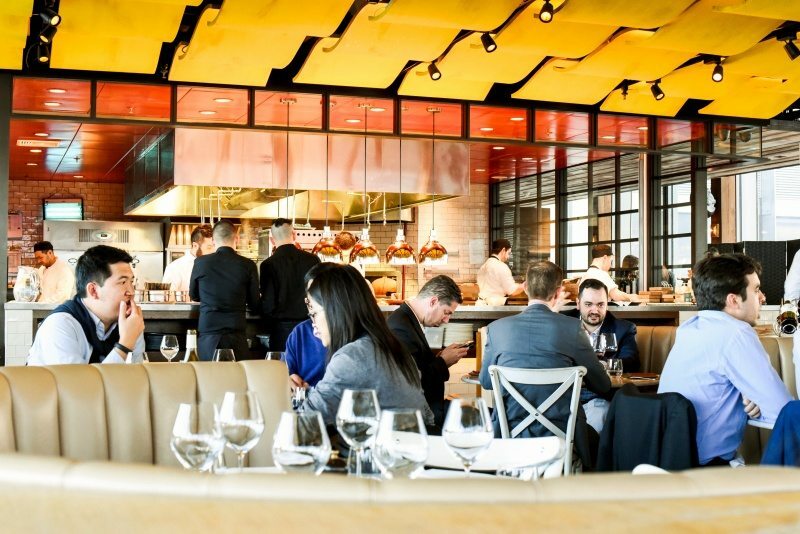 It beats anything I’ve sampled at French restaurants in London, including Chez Elles and Jean Jacques, or even the highly esteemed La Societe in Paris. 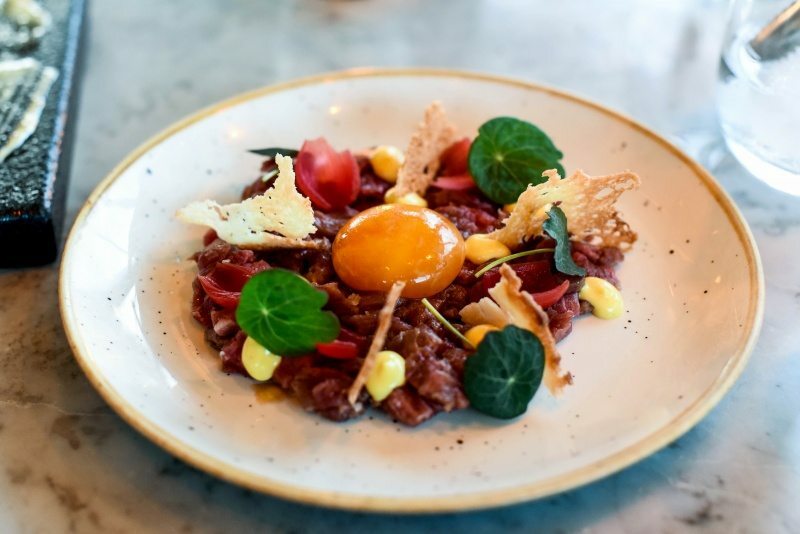 How one likes their beef tartare is a very personal thing, but for me the chunky meat texture and combination of salty, savoury flavours and contrasting crunchy textures is absolutely spot on. The yellowfin tuna, watermelon, black olive and English mustard (£12.00) was a little lacklustre. By no means bad but nothing noteworthy. I wouldn’t order it again. 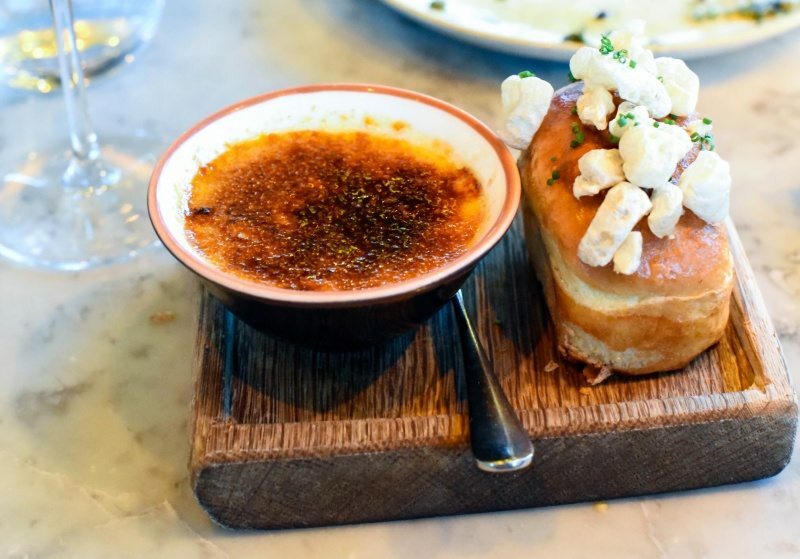 The foie gras crème brûlée with pork crackling brioche (£13.00), on the other hand, will have you rolling your eyes in delight. The crisp, sugary top marries beautifully with the rich, buttery smooth concoction concealed below, providing a sensationally good mouthful. The seared octopus with raw fennel, green sauce, lemon and chili (£13.00) was a bit of a dividing dish, with myself and Sophie really enjoying it and the others feeling fairly indifferent. 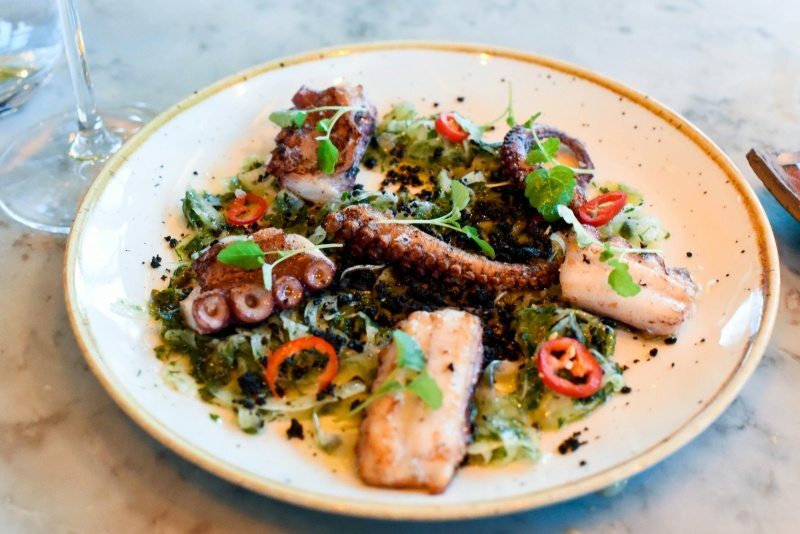 I personally really like octopus and thought the accompaniments were powerful and refreshing, but it was a boldly flavoured dish so likeability will ultimately depend on your taste buds. 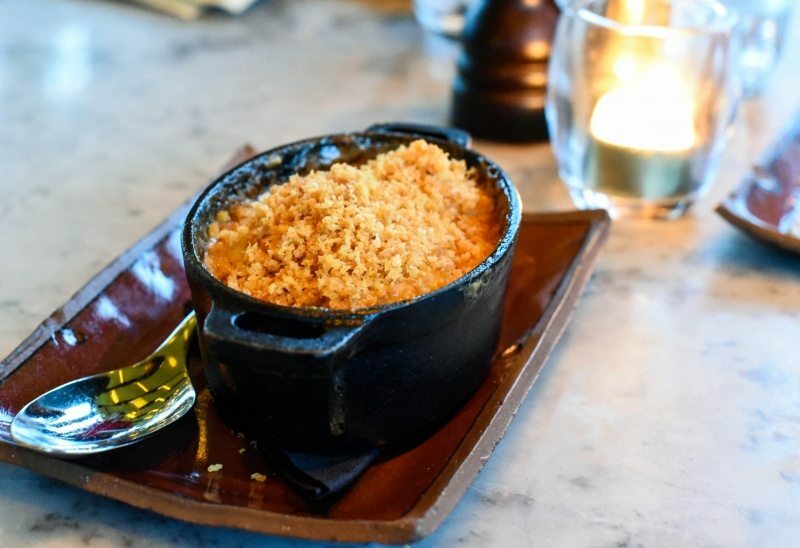 The baked haddock with lobster cream and parmesan crumble (£11.00) got a thumbs-up all round. It was well-executed with the perfectly cooked haddock swimming merrily in its sea of creamy goodness, and the parmesan crumble delivering welcomed crunch to balance. Although it is worth noting that those not so impressed by the octopus enjoyed this dish much more than those who really liked the tentacled former, which I think only serves to highlight that if you prefer light, fresh and particularly fish dishes, you will love the octopus, and if you’re someone into your subtle, rich and heavy flavours, you will go cray for the haddock and parmesan crumble. Filling up but refusing to stop before the “main event”, we took a moment to appreciate the twinkling skyline and setting sun around us. 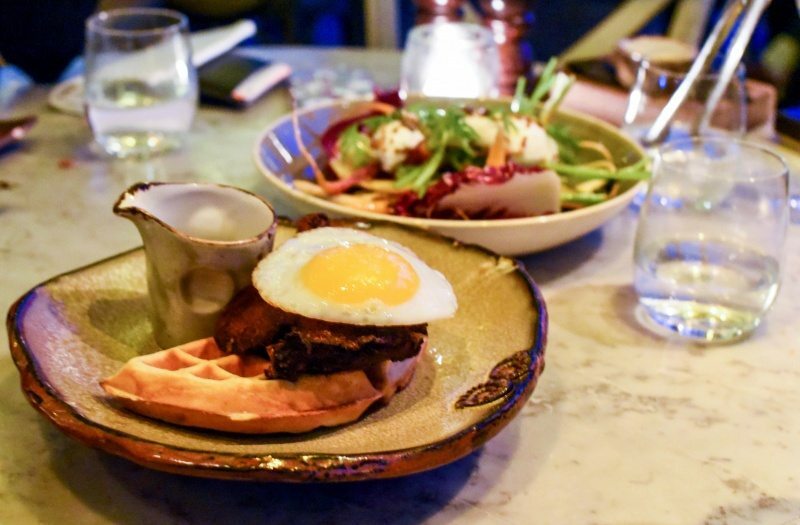 But we all know that there’s no rest for the wicked, and before long two orders of the infamous duck & waffle crispy leg confit with a fried duck egg and mustard maple syrup (£17.00) were placed before us. Although I know most people go mad for it, I have to say that I have never been particularly impressed by this Insta-famous dish. 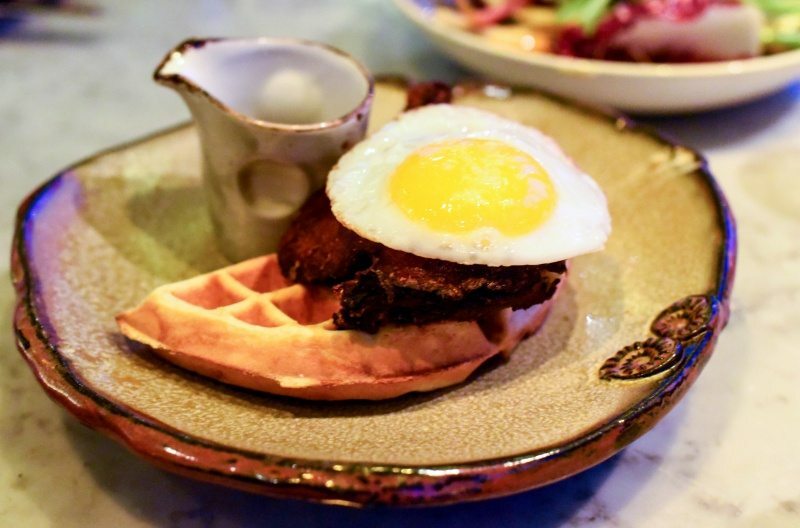 I find the waffle to always be served overdone, crisp and cold, and the mustard maple syrup not nearly punchy enough to really lift the duck. The whole plate is mellow in flavour and neither savoury nor sweet, and just a bit meh for me. 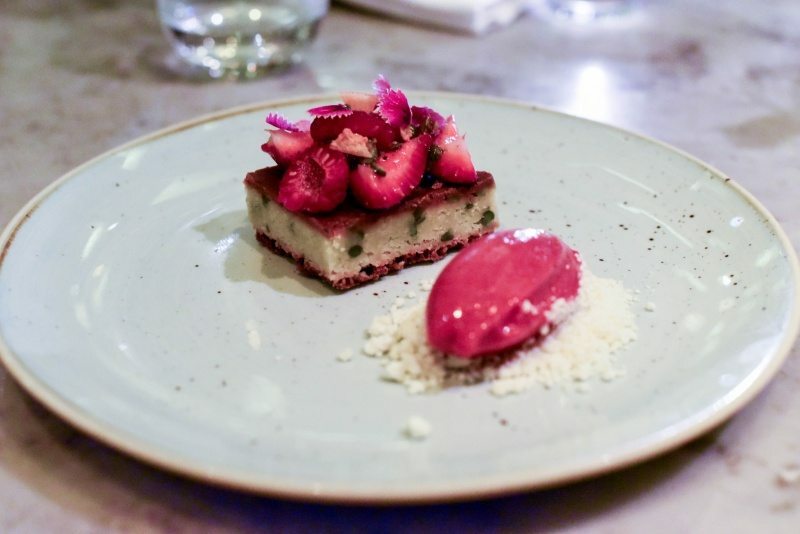 Despite it being the restaurant’s signature dish, there are far superior plates on the menu (*ahem* dates and beef 4 lyf), so I really urge you to branch out from the obvious order should you ever/on your next visit. 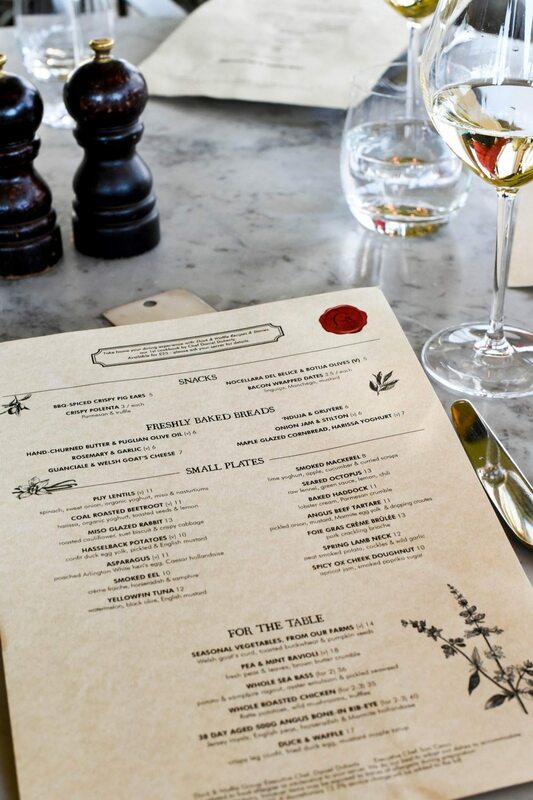 Again, if you’ve tried the duck & waffle before, I’d be interested to know what you think. 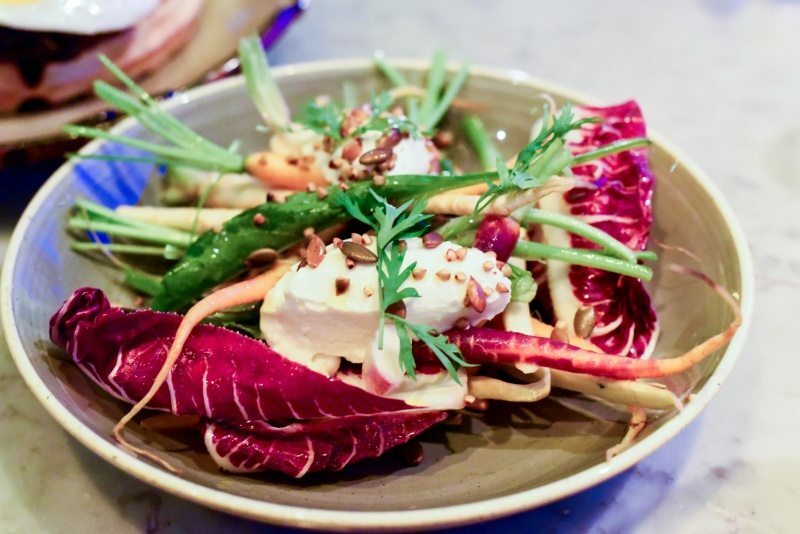 Our final dish ordered to balance its gluttonous predecessors was the seasonal vegetables, Welsh goat’s curd, toasted buckwheat and pumpkin seeds (£14.00), which was basically a plate of raw vegetables that was both unenjoyable and expensive. Definitely do not bother with this one! We ended the night with a round of espresso martinis (£13.00 each) and a chocolate blondie with white chocolate, pistachio, berries, honeycomb and raspberry sorbet (£10.00) to share. Which was utterly delish and just the right amount of sweet for us to finish on. 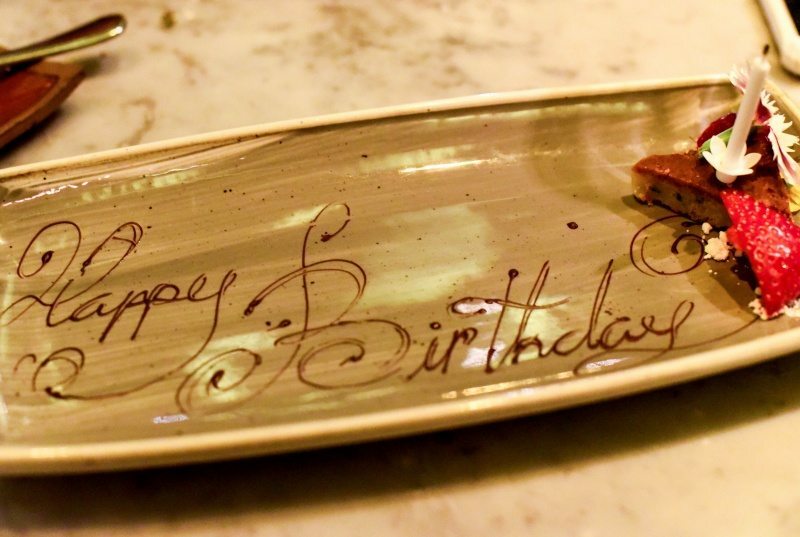 I absolutely love Duck & Waffle, and had a really special birthday evening there. The first time I went I was all in it for the duck & waffle, which resulted in me writing off the restaurant as another “paying for the view”, but fortunately I’ve been able to return a number of times since and introduced to the array of amazing dishes on the menu, that have lead me to now consider it to provide one of the best dining experiences in London. 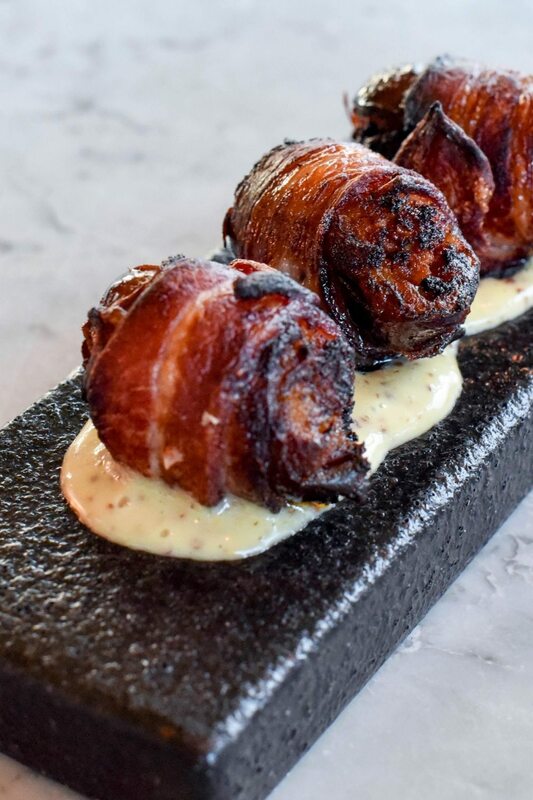 I second Gary – the bacon wrapped dates are worth going for if nothing else! 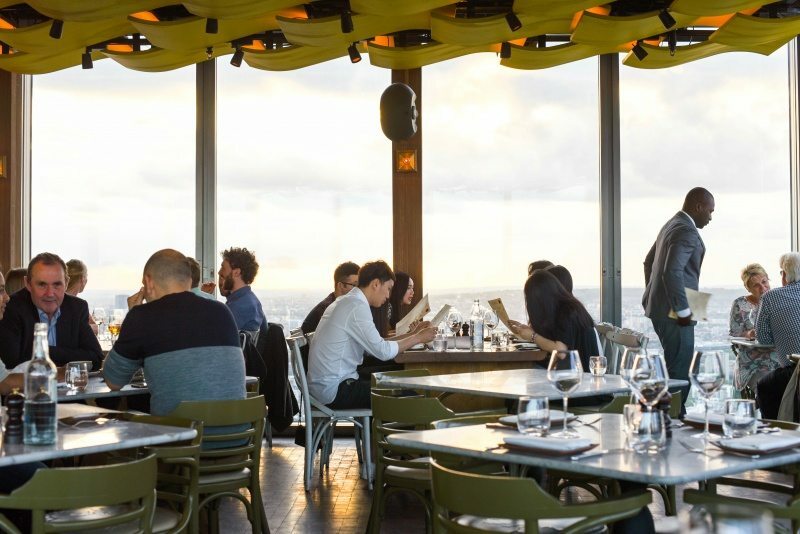 I’ve actually only been to Duck and Waffle for Breakfast and Brunch but think a dinner may have to be on the cards for the tartare! Hope you had a great birthday! So in love with the bacon wrapped dates! Glad you had a great time love! I”m a big fan of D & W, I need to go back when it’s light to really get the view! 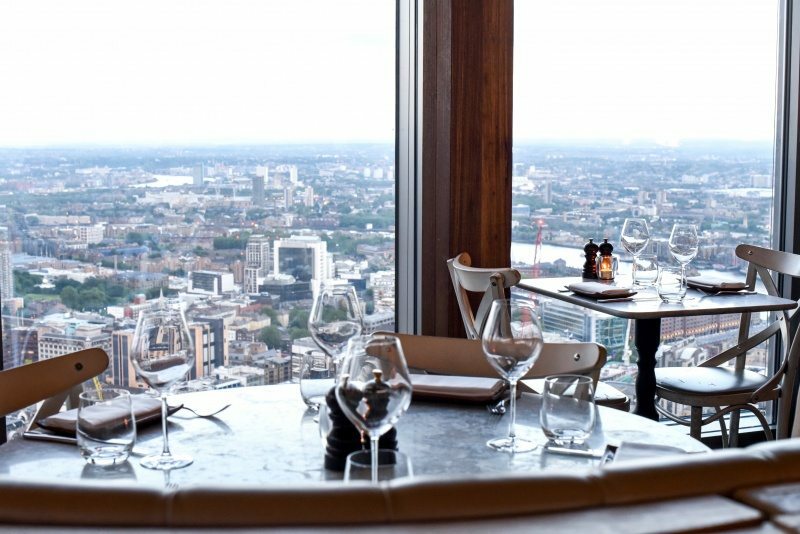 I still haven’t been to Duck and Waffle but did eat the Duck and Waffle does London in the Sky brunch last year and got to chat to Dan D suspended 100m above ground level in the process! For the most part, I enjoyed it. Massive fan of dates and massive fan of mixing sweet with salt so love the sound of the bacon wrapped dates!